Some common attributes, dialog fields, can be changed at one click. For example if a Command Station is replaced with another one with another Interface ID, and many objects are pointing to this. The common dialog field to change for the selected objects. 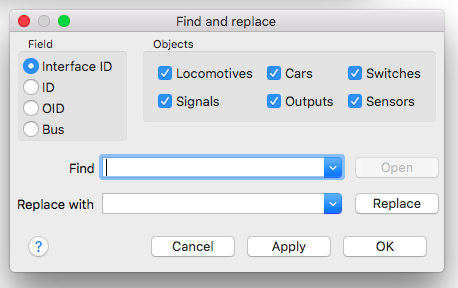 The object lists to process for the find and replace action. Find the OID in defined actions. If the OID was found the Actions dialog "Definition" will be opened. Multiple finds of the OID opens the dialogues of the other actions one after the other. Find the existing field value to replace. An empty find can also be used. If possible the combobox will be filled with predefined values. Free text ist also allowed. The replacement for the existing field value. Find objects starting with the in the find combobox If the field ID is selected, and opens the properties dialog. Do the find and replace and close the dialog. Do the find and replace. Do nothing and close the dialog. The "overview" tabs of many object dialogs contain a text field that can be used to filter the objects for the list, it can be searched fully or partially qualified by identifier etc. The characters and numbers to be found may be entered in the field and the search is started with press the [ENTER] key.